In today's data-driven health care system, no medical specialty is exempt from reporting on key performance metrics. Two, however, carry a heavier burden than most: cardiology and gastroenterology (GI). Cardiology in particular is tasked with reporting a rapidly growing array of data elements to multiple registries, credentialing bodies, and government agencies to meet multiple clinical and administrative objectives. Among the most significant are Appropriate Use Criteria (AUC) and the National Cardiovascular Data Registry (NCDR), both of which are expanding in the near future. The American College of Cardiology (ACC) announced the addition of the left atrial appendage occlusion and AFib Ablation registries to the NCDR to track outcomes for the treatment and stroke prevention of patients with atrial fibrillation. It also plans to add outpatient pediatric echocardiography to the already expansive AUC. Meanwhile, the number of GI providers participating in the GI Quality Improvement Consortium (GIQuIC) quality benchmarking registry—which is now a qualified clinical data registry for the Physician Quality Reporting System (PQRS)—is steadily climbing. Further, because GI is the most common surgical specialty in ambulatory surgery centers (ASCs), with a presence in more than 34% of facilities, it is heavily impacted by the Centers for Medicare & Medicaid Services' Hospital Quality Initiative and the ASC Quality Reporting Program. Most of the data are used to track clinical outcomes with the goal of identifying best practices and protocols to improve quality, but the information is also used to set policy, identify fraud, and determine reimbursements. For example, incentive payments for reporting PQRS have ended. Instead, providers now face penalties for not reporting 2016 measures that range from 4% to 6%, depending on group size. The stakes are high if data fall short on quality, accuracy, and completeness—risks to which many physicians are exposed due to inefficient processes that hinder their ability to quickly and accurately capture and report required data. In most cases, blame lies with insufficient resources to manage reporting and limited IT infrastructures that cannot handle the unique needs of specialized medical practices. Further hampering data integrity and reporting efficiency is the lack of interoperability. When data are siloed in multiple disparate systems—for example, documentation and hemodynamic systems that do not interface with EHR systems—the result can be incomplete or inaccurate documentation and, subsequently, patient records. All of these issues combine to generate flawed data that cannot contribute to the body of knowledge needed to advance the goals of quality initiatives or allow providers to validate the data they are submitting. In fact, they can actually impede the progress of quality initiatives and slow adoption of evidence-based care. 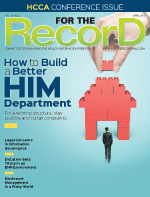 Structured reporting is emerging as a preferred approach to resolving data integrity challenges. Most recently, the ACC, in collaboration with the American Heart Association, the Society for Cardiovascular Angiography and Interventions, and more than a dozen other professional societies, issued a health policy statement defining the clinical standards for structured reporting in the cardiac catheterization suite. Adoption of structured reporting is critical for achieving data integrity. By ensuring every procedure report contains all the requisite data elements captured in standard formats, structured reporting removes the variability that limits adoption of evidence-based practices that guide appropriate treatment. Structured reporting allows information in the patient record to be queried to more fully understand treatments provided and identify any issues that may influence future care decisions. It helps clinicians determine whether the care processes and protocols in place are appropriate, and ensures AUC compliance—all of which lead to better outcomes and safer care. The catch is that it takes a great deal more than a policy statement to make structured reporting a true foundational best practice. It requires closing the technology gaps that keep many cardiologists and gastroenterologists, as well as ASCs, cath labs, and GI suites, from automating data capture, analysis, and reporting—gaps that force them to instead rely primarily on inefficient and less reliable manual processes that cannot keep pace with the growing number of registries and agencies to which data must be submitted. The solution is software that drives structured reporting by standardizing documentation based on industry best practices. By guiding physicians along procedure-specific documentation paths and automating data capture and reporting, these solutions ensure data integrity. Reporting efficiencies are increased and instances of human error that can lead to incomplete documentation and incorrect coding are decreased. The intuitive documentation processes created by structured reporting software also allow many of the required quality elements to be collected directly from procedure notes, eliminating the need for duplicate data entry. Software interfaces are also capable of gathering information from devices and other IT systems, further streamlining quality reporting. Making data collection an integral part of the physician's documentation workflow is central to a successful structured reporting strategy. This, in turn, boosts quality reporting effectiveness and efficiency, and instills confidence in the integrity of the data being submitted. Structured reporting solutions guide physicians in the capture of comprehensive case information, eliminating variability and gaps in documentation and streamlining reporting compliance and enabling greater participation in numerous registries such as the NCDR and GIQuIC. As with any technological tool, ongoing evaluation of functionality compared with current needs is key to realizing full value from an investment in structured reporting. It is a process streamlined by a maturity model that guides adoption and implementation of automated documentation and structured reporting software to ensure immediate and future needs are met without overwhelming the clinical staff being tasked with integrating these tools into their workflows. It offers a logical, incremental staged approach to expanding technology in step with the organization's needs. Stage 1: The procedure documentation system supports the capture of all relevant patient, procedure, and coding information as structured data that enables relevant flow and application throughout an organization. One of the primary benefits is a streamlined revenue process, which cuts time to bill. Stage 2: Health Level Seven integration is added to enhance and streamline interdepartmental communication and an improved medical record within the EHR. Additional benefits include automation of patient and provider profile updates and support for sharing, and the immediate availability of procedure notes within the EHR. Stage 3: Value-added features are introduced that create greater practice efficiencies for improved quality, outcomes, and patient experience. This includes automated transmission of referring physician letters, procedure notes ready for coder review, customized data reports, and patient education material. Stage 4: Adds integrated documentation for data consistency in all elements of the patient encounter to support registry reporting. This includes meaningful integration with the EHR, procedure documentation, and registry reporting systems. It also streamlines the downstream workflow associated with documentation. When properly leveraged, the impacts of structured reporting will be felt far beyond the four walls of the cardiac cath lab or GI suite. In the short term, structured reporting addresses the need for more efficient data sharing and the increased pressure on hospitals, ASCs, and other facilities to improve benchmarking, comparison, and internal evaluation. In the long term, it can be used to determine which approach to care is most appropriate at any given time for any given patient, which can extend out into broader population health programs. The maturity model helps achieve these objectives by providing a blueprint for the initial deployment and ongoing evaluation of automated documentation and structured reporting software, maximizing both utilization and value. — Steve Johnson is vice president of technology and clinical informatics, clinical documentation, and clinical software solutions at Wolters Kluwer.